This place is another restaurant in the city that mainly focuses on high quality burgers. The meat was delicious but the prices were high... in my opinion, bordering outrageous. A burger with a side will run you around $15 without tax/tip which is disappointing even for the high prices of Chicago. But looking beyond the price, the meat quality is impressive, the sides are decently sized, and the toppings are extremely fresh and some of the cheeses are definitely unique. The bun on the other hand was another disappointing aspect of what people consider an "amazing burger." For those reasons, the average rating is what I thought this place deserved. I had the grange burger and chose to have sharp white cheddar cheese and thick cut jalapeño slices added to the burger. So about this burger... The meat was high quality and cooked exactly to temperature (medium rare) and the additional toppings ($1 each) gave the burger some additional flavors. The best part of all though was the additional horseradish mustard that they give with the burger and also the homemade pickle! That in my opinion made it! I was extremely disappointed with the greasiness of what I consider a sub par bun. It didn't hold the burger well at all and was nearly non-existent towards the last few bites. Just some info... The burgers are served with a thick slice of onion, tomato, and lettuce. 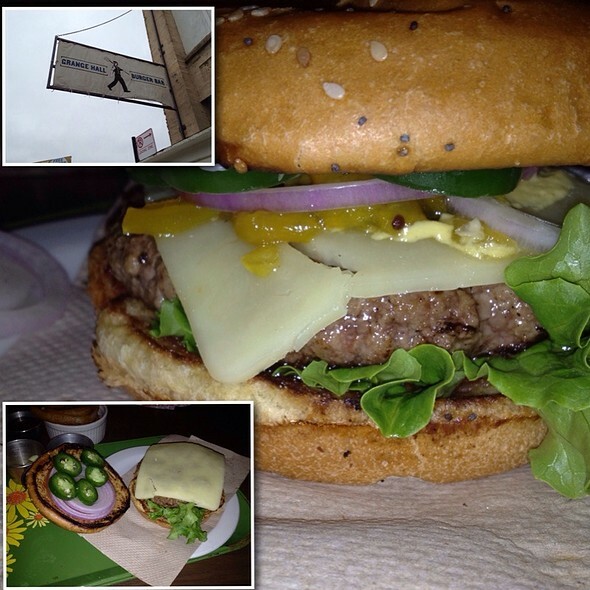 Overall one of the best quality burgers but too many disappointments to want me to come back anytime soon. Now this is a great side dish! Nicely battered onion rings served with a sweet BBQ sauce. They were a little greasy but what can you expect. The batter was also a little thick for being perfect, but the crisp made up for it. - Do order the beef patty. It is great quality and when cooked medium rare, it remains juicy and flavorful. - Do get the onion rings! It is much better than the fries or the bake beans in my opinion. - Don't drive a car to this place... It took me about 15 minutes just to find a spot and it was still a good walk away. Especially during lunch time, this place is in a prime location with minimally parking. - Be careful which additional toppings you choose... each are $1. I choose the thick cut jalapeños thinking they would be more than just a jalapeño cut in half... well it wasn't and for a buck I was really disappointed. 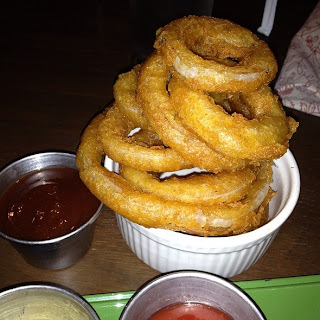 I like the mega sized onion rings from the place. That said, the burger is less oily and greasy. Fresh ground-beef from wholesale butchers melbourne.